Head and Neck Hemorrhage: What Do I Do Now? The head and neck are home to numerous essential vital structures, which when injured can STOP any experienced physician or surgeon in his tracks. Securing an airway can be challenging and bleeding can be difficult to control. This ‘very little room to manoeuvre’ anatomical space when wounded can occlude the airway as a result of direct trauma to the trachea or larynx. Airway occlusion can occur due to an expanding neck haematoma or torrential oropharyngeal bleeding with the added risk of aspiration. Ventilation can be impaired from a tension pneumothorax as the apex of the lungs extends into the base of the neck. The pleural space can easily be breached from a neck wound. 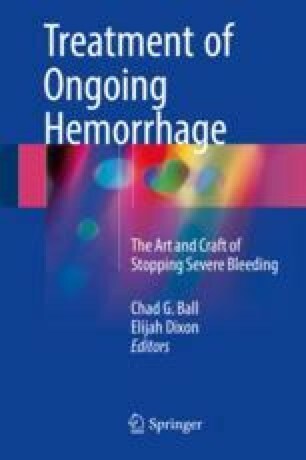 Exsanguination from external bleeding is possible from the base of the skull, neck and periclavicular wounds. Exsanguination from internal bleeding is possible from the oropharynx, bleeding into the pleural space, or a massive haemothorax with high-output pleural tube drainage from mediastinal vascular injuries. It is therefore prudent to establish a definitive airway in patients with actively hemorrhaging facial and neck wounds presenting in shock and a depressed level of consciousness. Oral intubation may be difficult due to airway compression from a large haematoma, bleeding into the naso-, oro- and hypopharynx and direct injury to the laryngotracheal complex resulting in distortion/deviation/obscuration of the vocal cords. Surgical cricothyroidotomy is the alternative and should be performed early. Externally bleeding wounds can be temporarily controlled with digital compression and/or a swab on a stick.